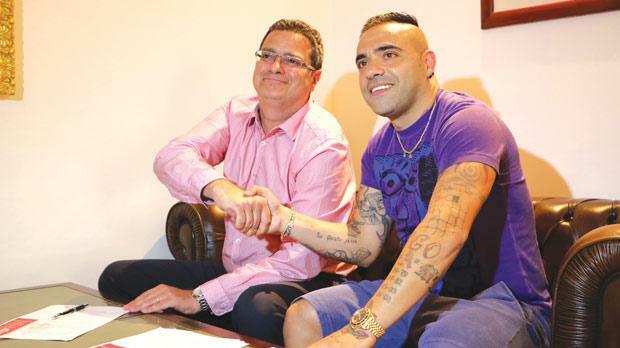 Birkirkara will probably be the last club in Fabrizio Miccoli’s eventful career but the Italian striker is determined to shine in his final season as, in his own words, he wants to bow out “with a smile”. Miccoli, regarded as one of the most prolific strikers in the Serie A in his heyday, yesterday pen to paper on a one-year deal with Birkirkara. It was all smiles at the Valletta offices of Adrian Delia, the new president of Birkirkara FC, yesterday as Miccoli rubberstamped his switch to the Stripes in the presence of Joe Zammit, the former club president who stepped down at the end of last season. The signing of a renowned player like Miccoli, who has had spells with the likes of Juventus, Fiorentina and Benfica, is a boost for Birkirkara, one that also has the potential to raise the profile of Maltese football, especially in Italy. Speaking to Times of Malta, Miccoli revealed that he contemplated retiring from football after a frustrating season with Lecce but his unwavering passion for the game allied with Birkirkara’s interest persuaded him to extend his career. “It was the desire to keep playing football as last season was not a happy one for me,” Miccoli replied when asked what motivated him to heed Birkirkara’s call. “I had decided to quit football, also because I had returned to Lecce after several years. “Then I had a chat with Giovanni Tedesco (Birkirkara coach). “I also spoke with my wife and family and, given that I feel fine and the willingness to play is still there, we have decided to embark on this experience. Last season, Lecce missed out on promotion to the Serie B after finishing sixth in Group C of the Lega Pro championship. Birkirkara were not the only club chasing Miccoli’s signature as the former Italy forward revealed that he also received proposals to join teams in the United Arab Emirates and India. “I had something from the United Arab Emirates and someone called to see if I was interested to play in India but… these countries are very far from home,” Miccoli said. “In my life, I’ve never taken a decision based on money. I spent six years at Palermo and (during that time) I didn’t move elsewhere because my decisions have never been influenced by money. “I’ve come here because the club really wanted me. I’ve met good, serious people and this club is like a family. Besides, there is also the coach (Tedesco) who is my friend, someone I know very well. “A lot of things have prompted me to choose this club… the colours as well. Miccoli’s arrival has further heightened the level of expectancy at Birkirkara who are tipped to mount a strong challenge for the Premier League title after their third-place finish last season. Their lofty ambitions match those of their new stellar recruit who turns 36 tomorrow. “We certainly want to do well and try to win the championship,” Miccoli said. “This is the target I want to aim for because I’ve come here to win. “I didn’t come here to do other things or to go on holiday as I left my family, my children, in Lecce and if that was my intention, I would have remained at home because the sea is also very nice there. The Stripes, with new coach Tedesco at the helm, also fancy their chances of progressing to the second qualifying round of the Europa League after being paired with Armenian side Ulisses FC. The potential reward for passing the first round is a lucrative tie with West Ham as the English club are surefire favourites to see off Andorran minnows Lusitans. The 2015/16 domestic season has not started yet but Miccoli has already had the opportunity to gauge the level of two of Malta’s top clubs after watching Birkirkara, his new team, beat champions Hibernians 2-0 in the final of the FA Trophy last month. “It was certainly a nice match,” Miccoli said. “The game was very tense and we didn’t see a lot of flowing football. There were a lot of long balls, also because the two teams were afraid to lose. Apart from Miccoli, Birkirkara have also acquired Slovenian striker Vito Plut who signed a three-year deal during the team’s training camp in Roccaporena. Tedesco is familiar with Plut as the two worked together at Floriana last season. Plut scored 12 goals in the 2014/15 Premier League campaign. The other confirmed foreign players at Birkirkara are defender Nikola Vukanac, from Serbia, Argentine centre-half Mauricio Mazzetti, Brazilian forward Liliu and Nigerian striker Shola Haruna who is still recovering from a knee operation. Birkirkara are also on the verge of tying up a deal for Adama Traore. The Mali-born midfielder was on the books of French club Calais RUFC in the last five seasons.